This dividend stock is cheap, but can it compete? Atlantic Power (NYSE:AT) shares are down 60% this year, and investors are wondering whether there's any upside left to this dividend downer. With Q1 earnings on Thursday, investors need to know the answer to a very important question: Is Atlantic Power stock undervalued? In part one of this segment, I examined the company's fundamentals. In part two, let's take a look at Atlantic's valuation. Before micro-analyzing sales and earnings opportunities, investors would do well to remember the age-old adage: "A bird in the hand is worth two in the bush." A company's assets tell us how much it owns, liabilities tell us how much it owes, and equity provides a peek at its overall standing. Birds or not, there's no beating around the bush: Atlantic is cheap. 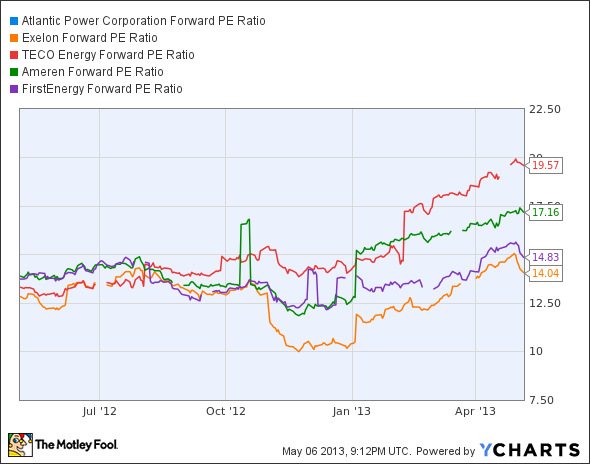 Trading at just 76% of its price-to-book ratio, investors don't have much faith in the utility's future. 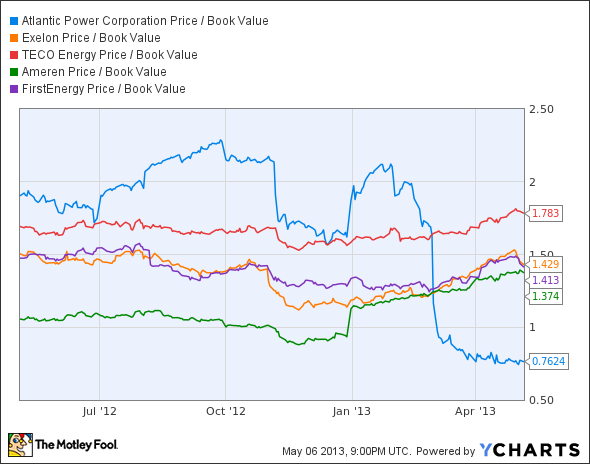 On the opposite end, TECO Energy's (UNKNOWN:TE.DL) books are a long way from the bargain bin. The utility's coal-centric energy portfolio has been on the rise this year, and expectations of more expensive natural gas have pushed prices to premiums in the last few months. While books provide a robust reading of a company's worth, there's no underestimating the power of cold, hard cash. For utilities especially, cash flow is the electricity behind its earnings, ensuring a constant build of capital to get it through infrequent but massive capital expenditures. 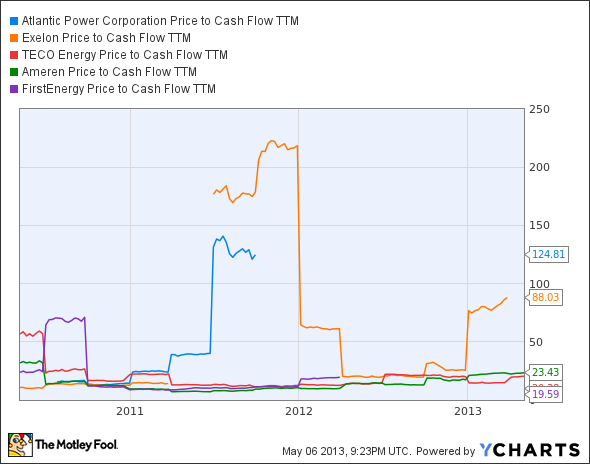 Unfortunately for our purposes, erratic cash flow makes any direct conclusions relatively difficult. 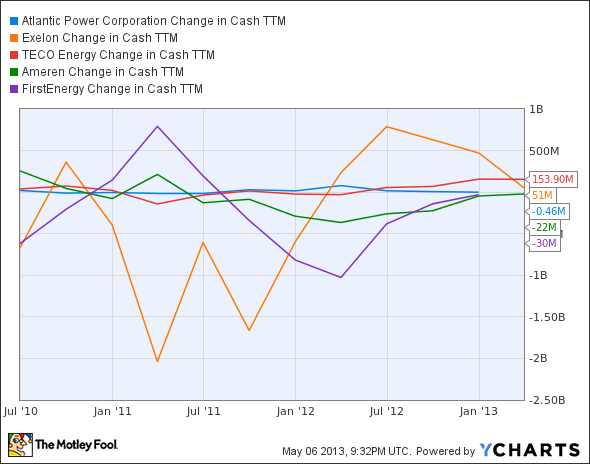 Although it's not linked to prices, let's instead take a look at changes in free cash flow over the last three years. TECO and Exelon (NYSE:EXC) have managed to maintain positive cash flows, but Exelon's relative scale makes its most recent gains less significant. On the lower end, FirstEnergy (NYSE:FE) fumbled away $30 million in cash, while Atlantic's operations have remained steady. Book value and cash may be good of indicators of value today, but share prices are also a result of expected earnings. For a rough-and-tumble look at each utilities' earnings expectations, let's examine each utility's forward price-to-earnings ratio. This measure compares a company's current share price to expected EPS. While utilities' year-to-year earnings are never a perfect indicator of future growth, it gives us an idea of what investors might expect in the coming quarters. TECO's priciness plays out once again, while Atlantic's negative earnings expectations literally push its ratio off the charts. Exelon got the cheapest future earnings around, followed close above by FirstEnergy. Ameren (NYSE:AEE) sticks to middle ground with a 17.1 forward P/E ratio, but it was trading at FirstEnergy's levels as recently as January. In part one, Atlantic's fundamentals looked lackluster, at best. In part two, we find that Atlantic's share prices are dirt cheap, even with negative cash flow and earnings expectations. Be sure to check back for part three, where I'll discuss the most important aspect yet – Atlantic's business model. Regardless of where it's been or how it's priced, a business can only be successful if it's got the structure and strategy to push its profits forward. Atlantic stock is not your usual dividend dynamite. It's a risky investment with the potential for big rewards – or big losses. But there's one utility out there offering safe growth at a fair price.